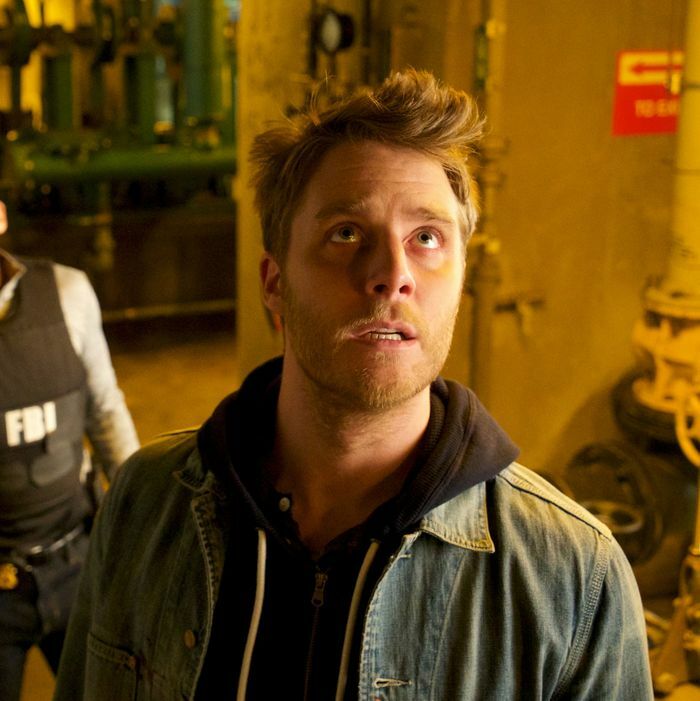 Hill Harper as Agent Spelman Boyle, Jake McDorman as Brian Finch. Previously on Limitless: Sands established an evil group of NZT-fueled masterminds, broke out of jail, and blew up a van. That’s the main gist of it. In the aftermath, Brian has once again joined the CJC to help bring Sands in. (Or take him down?) There’s just one problem: He doesn’t have an immunity to NZT anymore, so whenever he takes it, it makes him super-smart and he trips balls. Which leads him to hallucinate his kidnapped girlfriend (?) Piper getting pulled through the floor. Brian, not doing so hot, follows his best lead and attempts to track down Sands/Morra collaborator Clay Meeks somewhere in Chinatown. Law enforcement grabs him, but Brian is clearly deteriorating. “I am not gonna stop taking these pills,” he says. Brave. The one piece of information Meeks is able to provide is a name: Morneau. As in Jean-Pierre Morneau, the Canadian secretary of State, who is in town to negotiate a treaty. Brian and Co. head over to question him but, in that classic Limitless style, he is dead before they get there. Nobody has more murdered-just-before-they-could-talk characters than Limitless, that’s for sure. Because it’s the season finale, Brian goes to his dad’s house and makes peace. He apologizes for lying and says that he’s taking NZT to help people. That’s nice! Then he immediately goes to Rebecca’s place, where he pops another pill and stays up all night building models. For the greater good. Okay, this is the part of the episode with the frantic, overly detailed information dump, so here goes: A glacier between Canada and Greenland will soon split in half. Whoever controls the waterway will control a lucrative competitor to the Panama Canal. Morneau is in town to argue for Canada’s complete control of the channel, but his successor is more open to compromise. Oddly, Sands and his crew have been shorting stocks of companies who might benefit. They want people to think the deal will go through, but then kill off a second negotiator to tank negotiations. This causes the bubble to burst instantly, making Sands a billionaire overnight. I’m an economist and that all makes sense. Haha, no, it’s bonkers and convoluted. By interrogating the assassin, Brian is able to locate Sands’s NZT refinery. This, of course, leads to a Final Showdown. There’s a shootout and some low-budget explosions. Brian is tripping pretty hard at this point, as evidenced by the fact that he imagines himself in full ninja-superhero regalia. Also, Rebecca corners Sands in a stairwell and shoots him — mainly for pronouncing NZT as “En Zed Tee” but also for the murders and stuff. So that takes care of that. Sands is maybe dead. Maybe not. It’s unclear because this is a finale. Rebecca gives Brian a ride back to his dad’s house, where they have a small heart-to-heart. “You’re more mature emotionally and morally than just about anyone I know,” she tells him. That’s nice. Once inside, Brian finds his dad and … Piper? Sure. Sure! Okay. This scene encompasses everything frustrating about Limitless. How did Piper escape? Uh, she just kind of left when the shooting started. Did she take anything with her? Oh yeah, by the way, she has a magic booster shot that will make Brian immune to NZT’s side effects forever. Just my opinion, but I think if Limitless hadn’t spent 10 billion years explaining Canadian shipping channels, they might have had more time to flesh this scene out. Instead, we just have to take it at face value, as the lazy plotting that it is. As the episode ends, we’re treated to a funny (?) montage of bit players who appeared through the season, and this is where the show’s hubris really shines through. I barely remember any of these people. Was anyone itching for this? I was not. I might sound like I’m ragging on Limitless, and I kind of am, but that’s because there’s a lot of unrealized potential here. The cast is game, and the show has demonstrated both creativity and willingness to toy with procedural tropes. This is, after all, a show that married a tactical espionage operation with a riff on Ferris Bueller’s Day Off. But none of that wit was effectively applied to the season’s core conspiracy surrounding Edward Morra. Oh, speaking of Edward Morra, where was he? Nowhere to be found.